This story has been popping up on twitter this week and has gone viral on the internet. 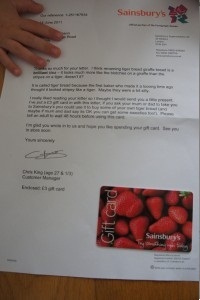 It’s an endearing example of how a company as big as Sainsbury’s can still be personal with their customer service. "Dear Saaiiiinnnnssssbbburyys. Why is tiger bread c/alled tiger bread? It should be c/alled giraffe bread. 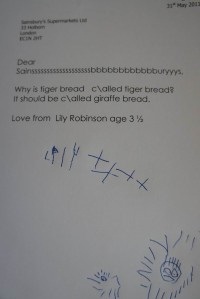 Love from Lily Robinson age 3 & 1/2"
I really liked reading your letter so I thought I would send you a little present. I’ve put a £3 gift card in with this letter, if you ask your mum or dad to take you to Sainsbury’s you could use it to buy some of your own tiger bread (and maybe if mum and dad say it’s OK you can get some sweeties too!) Please tell an adult to wait 48 hours before using this card. Do enjoy this absolutely delightful and life affirming video (thanks for sharing Alastair), which might just tug a few heart strings? you were singing notes that have never been invented." "It was more like Swan Pond than Swan Lake. I mean, it’s just terrible." "You sounded like Dolly Parton on helium." a chihuahua when someone trod on it." Grand National. Your daughter cannot sing." home? Have the police ever called?" Simon: "What normally happens when you sing in public, Deborah?" Deborah: "I’ve had a few people cry." Simon: "I can believe that." not. We’re good. All we need is some direction." Simon: "The direction is over there. Go towards the door marked Exit…"
anything more boring in my life." Simon: "I’ve got to stop this. It is so way, way off Mariah Carey. " Jay: "My voice is strong Simon. I need help." Simon: "Yes. You do, you need a helpline." This entry was posted by Sunil Bali on June 26, 2011 at 10:10 am, and is filled under Mindset, Set & Match. Follow any responses to this post through RSS 2.0. Both comments and pings are currently closed.